“As a lover of all that is learning, nothing makes me feel more alive than working with students in the classroom”- the opening quote to my first blog entry The Game Changer. My mission is that work with students in the classroom will provide experiences for them to become scientifically literate critical consumers of science while preparing for life and work in the 21st century, and to inspire the next generation of producers of science, the scientists, medical professionals, environmentalists, engineers, and technology entrepreneurs. This semester, my students, my partners and I are conducting action research around the Science and Engineering Practices of the Next Generation Science Standards. We are using these practices and the NGSS Cross-cutting Concepts to provide experiences so students can act and think like scientists and communicate that thinking beyond the classroom. My students, my partners, and I are trying to figure out the best way to mix these ingredients with student voice to inspire creativity, innovation, and lifelong learning. We are trying to create a classroom culture of scientific ways of knowing and lifelong learning. Weekly, we will highlight our class experience as part of our constant reflection and desire for feedback so we can move our learning forward. I happen to be one of Tricia’s partners in this journey. My name is Kim Haverkos and I was a science teacher at both the middle school and high school level before I went back to school for my Ph.D. in Educational Leadership at Miami University in Oxford, OH. My research focused on girls and science education and environmentalism. I, too, am passionate about the love of learning and science literacy for all students. I believe that the NGSS standards, practices, disciplinary core ideas, and cross cutting concepts offer us a unique way to work with students, educators, scientists, engineers, parents, and all others interested in science/STEM education to build a foundation for a scientifically/STEM literate society. I am excited to be working alongside Tricia as she engages in this learning process herself and with her students! Today’s entry: The Nanobug Course- an Introduction to Science and Engineering. Students engaged in design, test, iterate. Laying this foundation of a common language is critical when considered against the backdrop of STEM literacy. If we want students (and others) to be able to engage in discussion, defend positions, and make decisions around scientific ideas, there needs to be a common language to ground the discussions and decisions. Using the NGSS practices as the foundation of this activity allows students to experience the scientific method while at the same time explicitly engage in the nature of science. All of this points to the necessary complexities of becoming scientifically literate today. As part of our “research,” my partners and collaborators are trying out different lesson plan formats for the NGSS. This plan has four critical components for us: intentional time dedicated to the “Alone Zone,” an awareness of potential misconceptions about the concepts/skills, use of pre-planned questions to address misconceptions and probing questions to encourage student thinking, and the BSCS 5 E format. Reflection (through the Alone Zone)–an invitation to think deeply about our actions/thinking so we can move our learning/thinking forward and act with more insight and effectiveness in the future. Collaboration (through the Mini Think Tank)-Sharing a learning process with a group of people having the same experience but bringing in different perspectives to move learning/thinking forward and act with more insight and effectiveness in the future. How often are your students giving you a correctly-memorized answer? We call these responses “vomit” in class–students spit out exactly what they have been fed. My experience has led me to believe this happens more than we realize, especially at the high school level. According to research, when these students are posed deeper, probing questions about science concepts, they actually fail to fully understand those concepts and have misconceptions about science that are serving as barriers to deep conceptual understanding and future learning. My goal is for students not to communicate these kinds of “vomit” answers but communicate thinking and deeper understanding through many vehicles (writing, speaking, media, video). Students must become the meaning-makers to overcome these misconceptions by confronting their own prior observations, beliefs and sense-making and replacing it with a new model. This requires the identification of student misconceptions, providing an experience for students to confront their misconceptions, and through Alone Zone and Mini-Think Tank experiences with teacher facilitation (questioning and feedback) to help students reconstruct knowledge based on science evidence. Planning for questions enables teachers to assist the students in constructing his or her own meaning from the class experience and can spark curiosity for students to ask their own questions and have a bigger voice in their experience.Having some planned questions enables me to be a guide, but still allows the flexibility for me to utilize those many “teachable” moments to facilitate student construction of meaning. I am a work in progress on questioning-trying to use open probing questions to encourage student discourse and communication of thinking. This is one of the more difficult areas to build our individual learning as teachers. We want science and engineering activities to grow organically; we want students to drive their own learning; we want students to engage in asking good questions to help drive their learning. What is often missing from this process, however, is the modeling of asking good questions by the teacher to direct the learning. Students can’t be what they can’t see–if they don’t see good questioning skills presented by the teacher as the teacher facilitates the learning of the classroom, the students will have a difficult time engaging in the asking of questions themselves. This may mean we, as teachers, need to be more explicit about our own thinking, our own question development, and our own learning. Inquiry based learning has been the buzzword within science education for some time, but much like the students’ work with determining a common language within this lesson, defining inquiry based learning can be a slippery slope. Instead of focusing on inquiry, our thought is to focus on the student as learner and build experiences that allow the student to construct their own knowledge. While inquiry (in any of its’ forms) definitely falls into this category, our focus allows for a wider range of intentional and engaging activities to drive student learning and build a classroom culture of scientific ways of thinking and knowing. Because this work requires necessary planning, we have found the 5 E’s format for lesson planning to be a useful tool. The 5 E’s format is broken down into: Engage, Explore, Explain, Elaborate, and Evaluate. Each E serves a purpose in building the scaffolding necessary for students to construct their own knowledge (minus those pesky misconceptions!). The teacher needs to be intentional and explicit with this planning to layer this scaffolding appropriately and not leave gaps in students’ learning. This means developing those possible guiding questions ahead of time and seeking information on possible misconceptions before doing the actual lesson. It means providing planned and intentional time for reflection and collaboration throughout the lesson. Another key feature of the 5 E’s is that the teacher remains in the role of “the guide on the side” rather than “the sage on the stage.” Note that Explain, the traditional role of the teacher, is not part of the process until the third stage–and, if students are driving their own learning, they can also Explain what they have just learned rather than the teacher! Again, it is the explicit and intentional planning of these 5 E’s for the lesson that is so important! It is through this type of planning that a classroom culture of learning is built and sustained. Not only did this lesson immerse students in the practices of engineering, it has served as a touchstone for the importance of a common language in science. For example, in the second of week of the semester, the students and I used the nanobug discussion of “best course” to create and collectively define the common language of our “Evidence” rubric which we use to give feedback about communicating thinking through writing, speaking and media. Students understood the importance of a common language as a result of the hexbug discussion and used that experience to share their voice in the development of our feedback rubric. They are then empowered as partners in the formative assessment cycle. Watching a classroom like Tricia’s engage with the 5 E’s learning cycle, the NGSS practices, and centering student thinking is an amazing experience. The complexities of learning and thinking come to the forefront and the importance of the teacher as facilitator, co-learner, and artist become apparent. 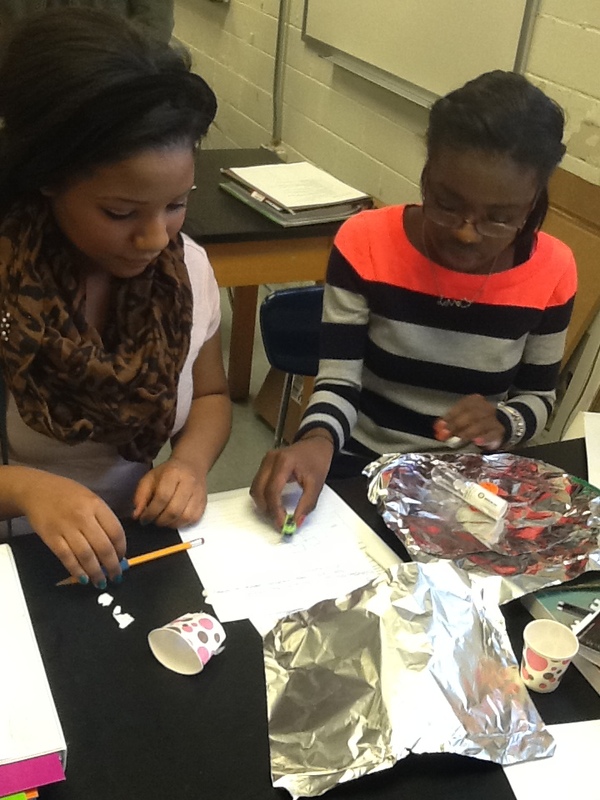 Engaging the students in thinking about their own thinking in a science classroom is a feat unto itself! And yet, through the intentional and explicit planning that Tricia engages in (for every lesson!!! ), these students come away from each experience better thinkers, better learners, and better at exploring and understanding science. The foundation of the lesson was choreographed very carefully, scaffolded for students to meet them where they were at, but the form that was created on top of that structure was different in every class, with students moving forward and backward, as Tricia guided them towards (but never pushed them into!) learning and understanding. What is too often unacknowledged is the amount of time, effort, and mistakes necessary for this process to work. Tricia engages her students and their learning through intense planning, constant formative assessment, reflection in action (for both herself and her students), and reflection on that action after the lesson is complete. Creating a classroom culture of lifelong learning directed towards scientific literacy (and multiple other literacies!) requires a teacher who is passionate about their own engagement in lifelong learning. Tricia demonstrates this on a regular basis with her students, and the sharing of these lessons is another facet of her own lifelong learning and desire to create communities of learning beyond the walls of the classroom. Please share your feedback about this lesson with us and help us move our learning forward as we strive to create a classroom room culture that best supports implementation of the NGSS.